Here we are hitting the home stretch of the eleventh season of Big Brother. Tonight will be an action-packed episode, with a POV competition, a POV ceremony, an eviction, and the beginning of the first part of the three-part HOH competition. The best part about a busy episode, though, is that there’s absolutely no time for silliness such as Natalie’s irrational fear of bugs or Jordan stumbling over simple words. Well, there will probably still be a bit of the silicone babe’s ongoing battle with the English language. That doesn’t stop the production crew from forcing the contestants to comment on the situation, of course. Natalie states the obvious about how her target is Michelle, and nominating Kevin is just a ploy. Michelle doesn’t understand Natalie’s (heavily edited) show in the meeting, but all she cares about is that she’s once again nominated. Kevin says he’s in on her ruse, but claims that he’s also looking for a way to get her out. We see Kevin and Natalie pretend to argue about the nomination in front of Jordan, babbling about how he knows they only had a final five deal. “If you’re not going to act weird, I’m not going to act weird.” Jordan seems to be falling for it, but does say “maybe it’s too good to be true”. Kevin sits next to her, and comments on how weird it is. Natalie heads upstairs, and says to herself that “I think it went good. Good job, Natalie.” Ugh. She’s now seen sitting in the hot tub with Jordan talking about the other two. Natalie says that she “needs to cover all angles”, and that she needs to be convinced that Michelle needs to go. Natalie drops her fake character for a second, and says Kevin also wants Michelle gone. She adds that Michelle also tried to evict Jordan. For once, Jordan shows some smarts. “I think it’s a little weird how Natalie was talking about Kevin being her main target, and then all of a sudden telling me that it’s Michelle that needs to go.” She says she’s going to live by Jeff’s advice to stick with Michelle. It’s now late at night, and in the dark Jordan and Michelle are talking about how they need to win POV. Michelle says she knows she can trust Jordan, and if she wins the veto she needs to keep the nominations the same and evict Kevin. They both pledge to help each other to make final three. After commercials, it’s time for the POV competition. As they walk outside, they all babble how this is a “do or die” situation. The contest is a “block party”, and there’s two stations with things that happened in the house. 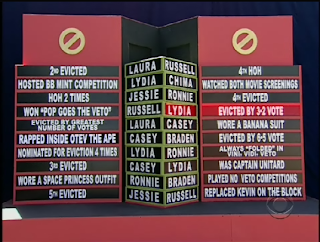 They have to pile blocks with the other house guests names in the correct order, and the person with the best time wins. Both Kevin and Jordan are confused by the first block…especially Jordan. Michelle’s strategy was to first lay the blocks on the ground, but she has problems finding blocks with the first two answers. Okay, Kevin’s commentary is officially bugging me. AS the other proceed through the game, Jordan is still stuck on the first question. Michelle, though, was just stacking with no thought about what’s correct, while Kevin discovers that he has one that’s incorrect. Both he and Michelle basically have to start over…while Jordan is still clueless. Poor girl. Kevin kicks it into gear, and Michelle claims that she’s getting nervous because she has no idea how the others are doing. It looks like Michelle and Kevin are close, but Michelle has one incorrect answer as Kevin buzzes with the completed answers. Kevin and Natalie are now assured final three, and Michelle knows that this means she’s probably going home. Jordan is also bummed that her destiny is now in Kevin’s hands. Kevin’s overwhelmed with how much he now has to think about. Ugh. We now move to the live show, and Julie’s interview with the house. She asks Kevin about holding all the power in the house, and he says he’s been losing sleep because of all the stress over this decision. Sure you have. Jordan is then asked how the house has been without Jeff. She says it’s really hard, especially at night when it’s so boring. “I’m sure he misses you, too”, Julie tells her. Natalie is then asked how tough it was to decide whether to open Pandora’s Box. “It wasn’t too hard at all”, she responds. Yeah, of course, since you had NOTHING to lose. Michelle doesn’t look to interested as Natalie goes on about the situation. We then see the silliness of the visitors who bothered the rest of the house while Natalie was being wined and dined by her boyfriend. Michelle is asked which visitor she hated the most, and she says it was the baby. After another commercial break, it’s now Kevin’s time to take himself off the block. Oh wait, we have more taped material. It’s right after the veto competition, and Natalie hears Jordan talking about her failure at the game. She asks who won, and after Kevin says it was him she leaps back into the HOH. After babbling about how this is the “best case scenario”, she brings him a bottle of Mike’s Hard Lemonade, and a light bulb flashes in Michelle’s big brain. She now knows they’ve been together this whole time. “They’ve just duped me.“ Duh! Jordan walks away, followed quickly by Michelle. They both have a nice little cry about how they were duped. 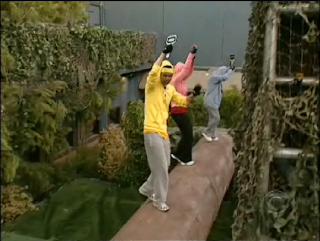 Meanwhile, Natalie and Kevin jump for joy in the HOH. “Kevin, we’re going for final two.” Natalie babbles about how she’s going to take “all the blood” for getting rid of Michelle. Kevin, though, has to add some doubt to this final two plan in the diary room. Yeah, like we believe you. Kevin and Natalie go back and forth a bit about how they’ve never broken their word, and although he rolls her eyes when she promises him “on her engagement”, they declare themselves final two. He still puts up the charade, though, when Michelle asks about them duping her. He babbles about their final five deal that has expired, and Michelle uses the opportunity to attempt to make a deal with him. “I’m not playing for second”, he says. Ugh, enough of this. Michelle is now once again trying to work on Kevin, and now she promises her jury vote if she stays one more week. “I know if you go against Natalie, you’re going to need all the votes you can get.” Michelle points out that Jordan hasn’t campaigned to Kevin, and he says she really should. 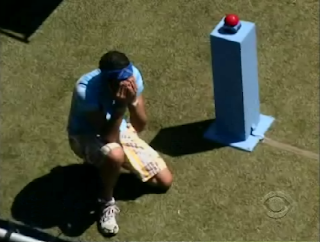 In the diary room, Kevin again plays the game and says he’s actually contemplating such a move. Oh god, we now go to Julie’s interview with Natalie. The first question is about all the lies and deals Natalie has told, and Natalie says that she has never gone against Kevin. She follows up with the lie about her real age, and whether it has helped or hurt her. Natalie claims that it has tremendously helped because the others have thought that she’s a “young, naïve, even immature, not too smart person”. Hmmm, wait until you hear what the jury thinks of this lie. It’s now eviction time, and obviously Kevin takes himself off the block. Jordan then stands for her final plea, and as usual doesn’t really say anything except that he had already told her that she was safe. Michelle then puts on her devil horns, and babbles that if she was taken to the final two he would be guaranteed the prize money because “I’ve burned so many of the jury members I don’t stand a chance”. She says the decision is whether she can “raise hell against you in the jury house, or raise hell together with you in the final HOH contests”. Kevin then stands, and, as expected, evicts Michelle. After the meaningless time where they all watch her picture turn grey, Julie begins the interview by asking why Kevin kept Jordan over her. She says that he believes the jury will vote for her in the end, but she really doesn’t know what the jury is thinking. Julie follows up about Jeff’s decision to evict Russell. She says that it was a game changing decision, and that it was the beginning of the end. This week we do get goodbye messages, and Natalie starts by saying how she has always wanted to see her leave. Kevin hopes that she’s not upset with her (nice jury vote ploy), and Jordan adds that she’s going to “really, really miss you”. Julie finished up by asking why so many people had such strong opinions against her, but Michelle’s response really doesn’t make enough sense to repeat here. With Michelle’s departure, it’s time for the beginning of the first part of the final HOH. 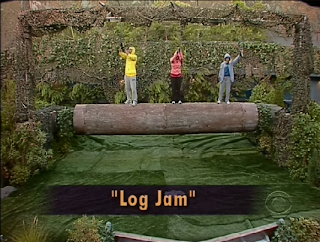 As expected, it’s an endurance contest (“Log Jam”) where they all are standing on a giant rolling log hanging onto their key. As the show leaves, the predictable addition of "rain" is added to the game. How exciting. See you Thursday to see who is the last person (Jordan) evicted.